Canadian based Uranium Participation Corporation invests all of its assets in the acquisition of uranium which it plans to sell at a later date when the price is beneficial. 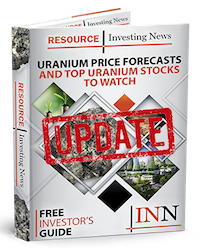 Uranium Participation Corporation (TSX:U) has released a report updating its net asset value. According to the company value has increased to C$688 million. Canadian based Uranium Participation Corporation invests all of its assets in the acquisition of uranium oxide in concentrates (U3O8) and uranium hexafluoride (UF6). The company’s goal is to store its uranium until the spot price increases. On the last trading day of November 2018, the common shares of UPC closed on the TSX at a value of C$4.82, which represents a 3.21 percent discount to the net asset value of C$4.98 per share.